The main objective of this blog post is to give you an idea about Coroutines in Unity3D. Why do I have to use the update function every time? What are Coroutines and how can I use them? Why should I use Coroutines? What are the best cases to use a Coroutine? How can I sequence my game flow? Imagine a case where you have 1000’s of Gameobjects and all of which have some execution in their Update() function. Trust me, these Function calls may not be heavy on paper, but when you have so much of calculations executed every frame, outcome would not be so ideal. Mind you, that does not mean that we have to stop using Update(), it is actually beautifully designed to get the work done. It’s just that certain cases cannot be handled well with Update(). And this is where Coroutines comes into picture. This post will be a theoretical journey, but please do bear with me on this one as it surely will be worth your while. "A coroutine is like a function that has the ability to pause execution and return control to Unity but then to continue where it left off on the following frame." "It is a special type of function used in Unity to stop the execution until sometime or certain condition is met, and continues from where it had left off." HOW TO USE THIS SPECIAL FUNCTION..? Firstly, remember one thing, don’t forget to use IEnumerator as a data type of function and second is, we can only start a Coroutine with function called "StartCoroutine(name of Coroutine)". Before going further I recommend you have a look at WaitForSecond, Yield, so it would become easier for you to understand. How was it? Did you catch any the balloons? "It is essentially a function declared with a return type of IEnumerator and with the yield return statement included somewhere in the body. The yield return line is the point at which execution will pause and be resumed the following frame". Here, Yield is like return type statement where execution gets stopped and goes to the function where it was invoked. After execution, it comes back to a point from where it left the execution and starts executing next lines. Step 1) Take a Canvas and a Panel inside it. Step 2) Create an empty C# Script (I prefer coding in C#) and you can name it as you like. Step 3) Assign it to the panel and hit the play button in your Unity to see the magic. I'll explain the magic; here PerformFadding() is a Coroutine where fading is performed. As I said earlier, you need to call the Coroutine with StartCoroutine() function. 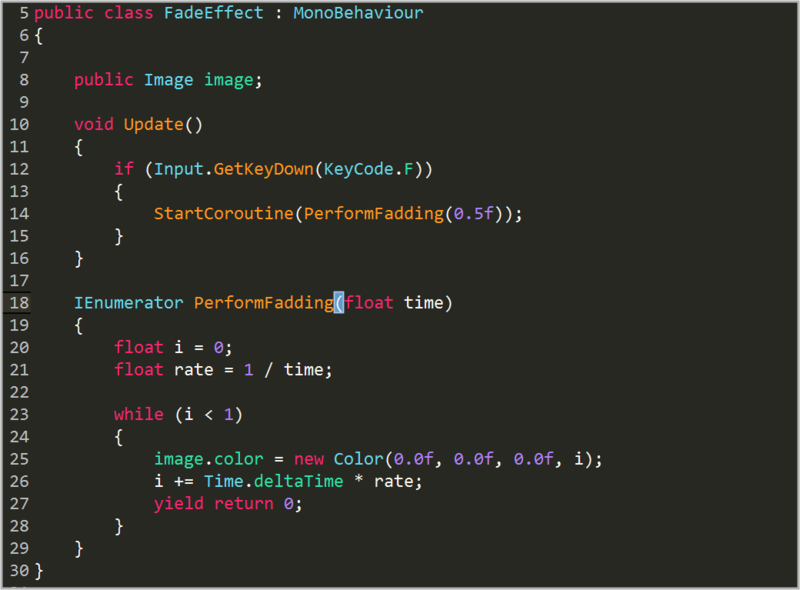 As you can see from code that Coroutine is invoked on pressing the 'F' Key. When it is executed, it starts increasing alpha of the image bit by bit every frame until it's done. It's almost like it started a parallel execution to fade the screen. Here we have calculated the amount to increment (value of i) for each frame execution, i.e. how much should the Alfa be increased, depending upon the given time. Oh wait that’s not all! There is an option to delay the execution as per your wish. Isn't that great? This can be achieved by using WaitForSecond function. Isn’t it convenient? Well trust me, it is! Here, execution waits for some time as specified in the function and resumes afterwards. It is repeated until Coroutine finishes its execution. Let’s again take the same example and change yield statement as shown in the code above. After changing in the line of yield, save it and push play button in Unity. Did you see any change in fading behavior? Here WaitForSeconds() waits for specified amount of time (in our case it is 0.5 f => 2.5/5 = 0.5f) and then continues its execution again. For better understanding, play around with different values to see the effect of WaitForSeconds(). WaitForSeconds() is a very useful in sequencing animations and stuff. WHY SHOULD I USE COROUTINE AND NOT UPDATE..? You might be wondering Coroutine works just like Update, then why Coroutine? Whereas Coroutines are best when you want to schedule some events. Imagine you have a visual effect to be performed every few minutes. This would be something like calling out someone continuously knowing that no one is supposed to respond! Waste of Energy Isn’t it? Coroutines have only a tiny overhead and can be preferred over an Update method that is called all the time needlessly. Don’t forget about what I had said earlier, Coroutine is not a substitute of Update! THAT’S WONDERFUL, BUT WHERE AND WHEN CAN I USE COROUTINES..? Typically there are three situations where it makes a lot of sense to use coroutines (that I can think off the top of my head). Yes this is how sequences are maintained in games. Here, first animation state is changed, then the camera state is changed , and it waits till the movement of player is over. As soon as the player movement is over the state is changed back to the idle and respective motion method is called. For smooth ending another WaitForSeconds() is set. 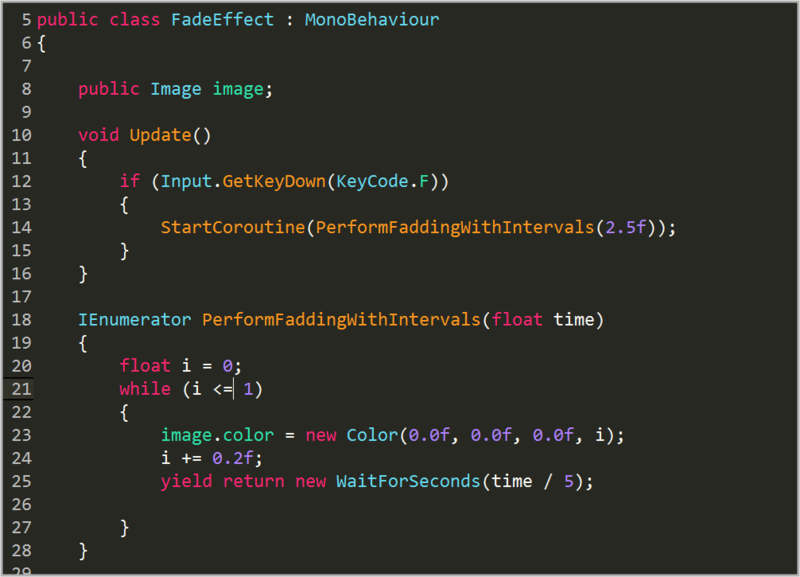 Now if you check the third line, another coroutine is called player.PerformMovement(), Yes its possible! Now by using yield ahead of the StartCoroutine(), this will force the current coroutine to wait until execution of player.PerformMovement() is completed. This is how you can handle a sequence in your games. It’s not perfect, but a possible solution. Imagine a grid with items 1000 x 1000 and some calculation is to be done for each grid item! That would take heck of a CPU to get that done smoothly (if executed in every single frame). But luckily (because of Coroutines) there is a possibility that allows you to divide these heavy calculations into multiple frames and resulting in lesser CPU overload. As seen in the code above, I have divided its execution in parts. Here only the j loop will be executed and cut off until it reaches the next frame. In simpler words, only one loop of execution will be performed for the i loop in a single frame. This is how Coroutines can also help optimizing games. Now as shown above if you want to perform some initialization (or something like) that after an asynchronous process is completed, than there is no perfect solution other than coroutines! Here I want to perform some stuff, after login to FB process is completed. So I’ll check if Fb.isLoggedIn() every frame. As soon as the condition turns true, required action will be executed. WOW COROUTINE ARE SURELY VERY USEFUL..! BUT I WISH MORE OF IT..! Does it get any simpler than this? Recently Unity guys have added some new features to Coroutine which are WaitUntil, WaitWhile. These features can only be used with Yield statement. WaitWhile suspends the execution until the given condition remains false. COROUTINES SOUND LIKE ANGELS IN THE SKY..! IS THERE ANYTHING WRONG WITH THEM..! Coroutines come with a tag "HANDLE WITH CARE". Coroutines create a flow of logic which is incredibly hard to follow (as there is no explicit structure in how they execute or in what order). In addition, coroutines generate a bit of garbage when they are used so that’s another reason to be kept in mind. "If you can't follow your coroutine logic, you've probably used one where you shouldn't have." GREAT! READY TO USE COROUTINES IN MY GAME...! TRUST ME ON THIS ONE ,You don’t want to turn Coroutines into your enemies.